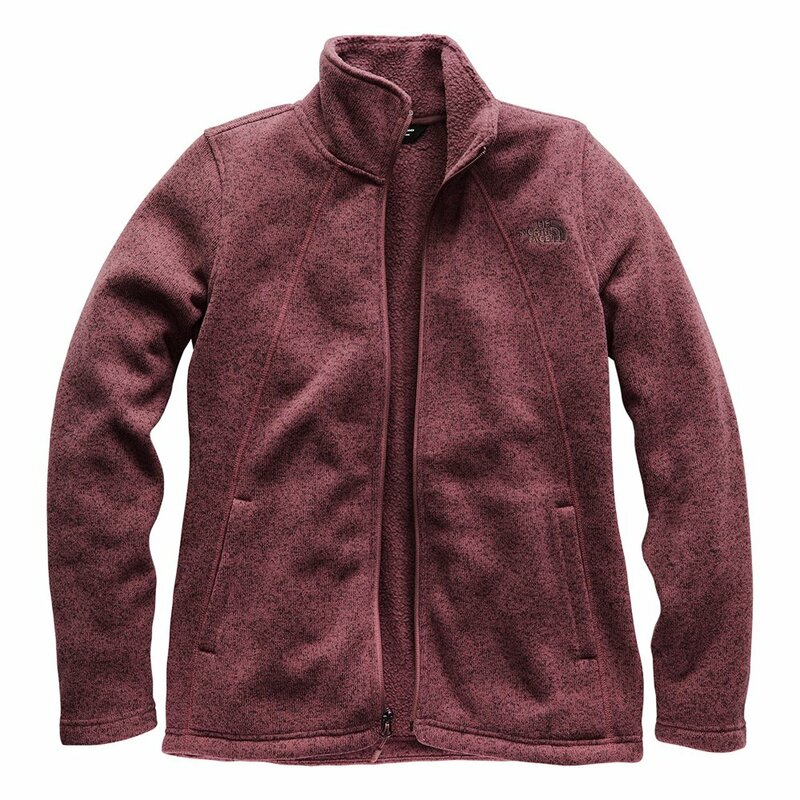 A lofty, sweater-knit fleece gives The North Face Women's Crescent Full Zip Jacket versatile, casual style and potent warmth. This piece includes a reverse-coil zipper down the front and open hand pockets. The relaxed fit and sharp stitching create a low-profile but original look. This sweater is very versatile. I wear it to work over my scrubs, out hiking or camping, and just around the town when I'm dressed more casual. I loved this sweater so much I ordered a second one in black! The black was a little lighter than I expected (a slightly faded black) and the vintage white heather is a heather gray (I feel like the picture online has a tan/beige tint to it). The sweater fits perfectly. When zipped up it is definitely form fitting, but thats what I like to wear. I'm 5' 5" and 135 lbs, bought a small. If I wanted to wear a sweater under this I'd probably order a medium. But a small is perfect over a shirt or a thin long sleeve. I also wear this zip up under a jacket to add warmth. It is lightweight, still keeps you warm, but I'm still a little cold on a windy day. After some washes, the texture of the sweater definitely changed. I forget how long it took, but the soft fleece turned a little more stiff, which I expected for fleece. The outside of the sweater now feels more like wool, but I actually don't mind it at all. The jacket kept its structure and almost looks better after the washes. Overall, I would recommend to anyone looking for something comfy, stylish, and versatile. I'm surprised by all of the positive reviews. My fleece began pilling the first time I wore it and has gotten worse with each wear. It has been lightly used and not at all abused so I'm surprised and disappointed with the quality of the fabric. I feel embarrassed to wear it outdoors it looks that bad. Terrible quality. The material pulls after just days of wearing. I absolutely love this fleece. It is very comfortable and I love the red colour. Now it is getting a bit warmer I have been wearing this instead of a jacket as it is very warm by itself. It has great pockets on the inside if you are carrying phone/wallet etc. and want them to feel safe. I would definitely recommend. I needed a fleece jacket that looked appropriate enough to wear to my frigid office. This jacket is very comfortable and does the job to keep me warm. I sized up to a large which looks a little bulky in the torso area but the sleeve length works great for my long arms. Plus, with the extra room I can layer up. The one thing I wish it had was zippered side pockets. I'm paranoid about things falling out of my pocket so I like the security of a zippered pocket. It's especially useful on windy days on the beach. I've been waiting for this jacket to come back in stock in my size. Since I'm a 2X I don't have that many options. This is the best light weight jacket I've purchased in a while. Since winters are non existent in Texas when we have had those cold 30 degree days this jacket has kept me warm. Nice thick sweater material on the outside and fuzzy fleece inside. Haven't worn it in snowy weather yet, but I plan on taking this with me when I go! Stylish, lightweight, and Great fit! Gift for my niece. She uses it mainly for casual and cold weather. Fits more snug than average jacket but that's a good thing because it keeps her warm. Love the over all look and feel of this jacket.. This jacket fits great and is so soft and comfortable! I love that I can dress it down or up! It's the perfect jacket for cold to cool weather. I love it! I bought it for my sister-in-law and she loves it!